Can paying over £40/$40 guarantee you an anti-dandruff shampoo which works? All this time you’ve been fighting dandruff, if you’d invested a little more, could you have banished dandruff flakes for good? 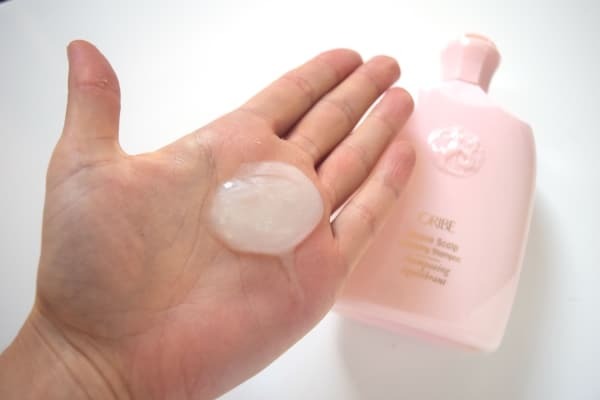 Is ORIBE Serene Scalp Anti-Dandruff Shampoo – a dermatologically tested, vegan and gluten-free anti-dandruff shampoo – worth its hefty price tag? Can paying more for an anti-dandruff shampoo get you results worth paying for? With a hefty and maximum dose of 2% salicylic acid – alongside partnering fruit extracts which work in an extremely similar way… we’re about to find out. But first, who are Oribe? Are Oribe hair and scalp care experts or have they made a fancy shampoo and slapped a sky-high price tag on it? Oribe are a family of professional haircare products – search for their website and you’ll read this as – award winning professional haircare products. Award winning because many of their haircare products have won accolades from well-known magazines and retailers such as best beauty buy (InStyle magazine), innovative beauty award (Ebony magazine) and beauty award winner (Neiman Marcus). Launched in 2008 Oribe haircare (named after their co-founder Oribe Canales) set out to be the best, to push the boundaries of haircare to – blend craftsmanship, performance and decades of styling experience from the top of the editorial and salon worlds, to create products which a consumer can see and feel the difference. Oribe are luxury, but they’re also self-proclaimed as ultra-high-tech – bowing to the expertise of innovation labs to ensure their formulas deliver and outperform. A promising backstory. Now onto the shampoo itself, how will yours arrive? Buy a 250ml bottle of ORIBE Serene Scalp Anti-Dandruff Shampoo and you’re going to receive a soft-touch cream and embossed box with baby pink accents. This is probably the first dandruff shampoo that’s tried to put the glam into dandruff control, and it makes a welcome change from the clinical white tubs we normally review. 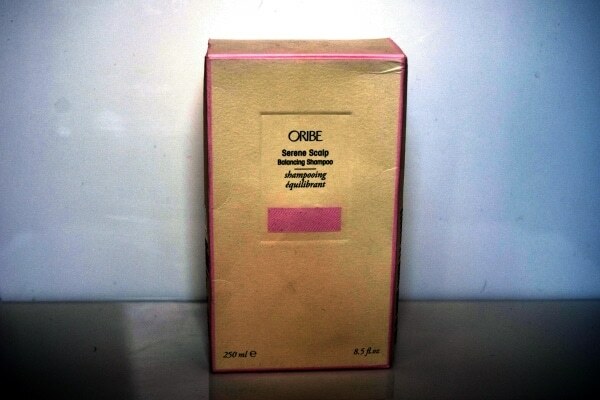 Open from the embossed seal lid and out slides a truly minimalistic bottle of ORIBE Serene Scalp Anti-Dandruff Shampoo. There’s no doubt this anti-dandruff shampoo has style – although made in in the USA, ORIBE Serene Scalp Anti-Dandruff Shampoo is distinctly Italian in design. With a disc-top cap, a quick press is all that’s needed to open a bottle and with a firm squeeze (and it needs to be firm as the bottle is sturdy) a fruity and floral smelling, sparkly shampoo exits. 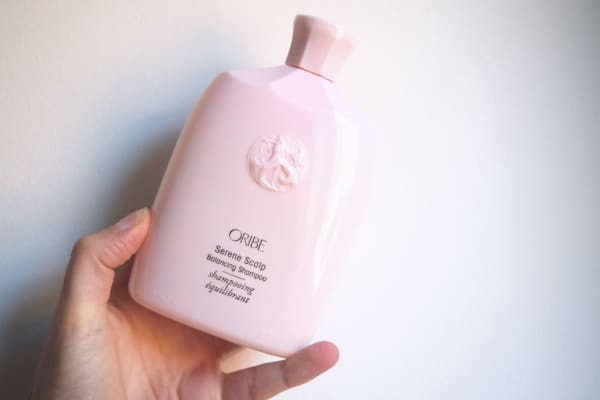 So how does ORIBE Serene Scalp Anti-Dandruff Shampoo wash? Does it foam? How much do you need to use? 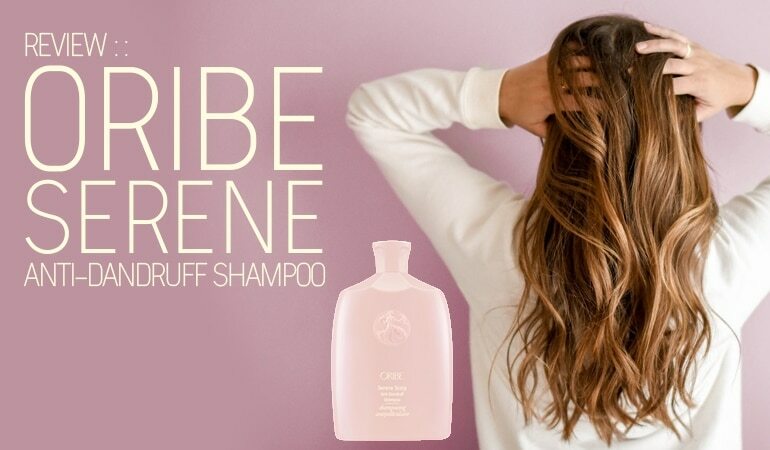 Try a bottle of ORIBE Serene Scalp Anti-Dandruff Shampoo and you really will not notice any negative difference or change between Oribe and mainstream shampoo brands – in washing performance. A small pebble of shampoo is all you need to massage in, work around and wash out well. 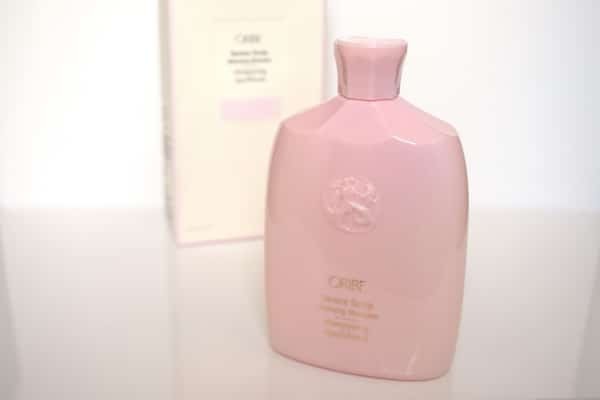 Oribe make a point of their products having fine fragrance and Oribe Serene Scalp Balancing Shampoo doesn’t disappoint – although there may be some negatives to this we’ll discuss soon. The shampoo also doesn’t dry your hair or scalp, so normal conditioning is all you need – no drying anti-dandruff shampoo side effects. Looking good so far – now what about the formula itself, how does ORIBE Serene Scalp Anti-Dandruff Shampoo work? Does it work? ORIBE Serene Scalp Anti-Dandruff Shampoo is aimed at – doing away with loose dandruff flakes once and for all, while also removing excess oil and promoting a balanced scalp. Which by the way – evidence shows when your scalps well hydrated with a healthy skin barrier – helps to rebalance the cause of dandruff – a change in scalp microflora. The active ingredient in the shampoo is salicylic acid. Salicylic acid is a keratolytic ingredient i.e. an ingredient which can soften and dissolve dead skin cells – ones which have visibly formed flakes and ones which are ready to shed into flakes. You can think of salicylic acid like an exfoliant. It’s very usual for anti-dandruff shampoos to contain salicylic acid as a partnering ingredient to other anti-fungal active ingredients. However, it’s not so usual to find salicylic acid in its maximum allowed EU concentration of 2% – which is exactly what ORIBE Serene Scalp Anti-Dandruff Shampoo contains. Note: Salicylic acid also has mild anti-bacterial benefits. While there are many published studies comparing the dandruff efficacy of well-known antifungal ingredients partnered with salicylic acid, there are none testing the effect of salicylic acid alone. For this reason and for the reason of how salicylic acid works, we’d recommend ORIBE Serene Scalp Anti-Dandruff Shampoo for mild cases of seb derm, mild scalp psoriasis, for dry scalp or as an in-between anti-dandruff treatment for moderate to severe cases of dandruff i.e. 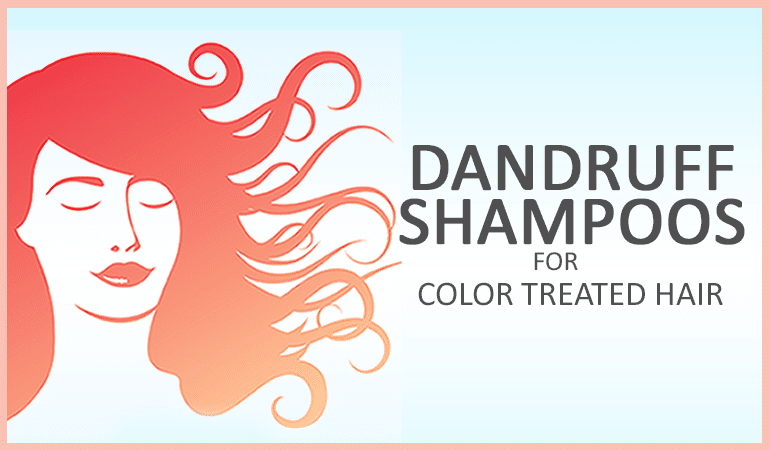 an exfoliating treatment which will help reduce the appearance of dandruff alongside improving general scalp health. All 5 of these ingredients are natural alpha hyroxy acids (AHAs) meaning they work in the same way as salicylic acid to dissolve away dead skin cells before they can become dandruff flakes. While salicylic acid is perfect for areas of oily skin, AHAs are perfect for areas of dry skin. ORIBE Serene Scalp Anti-Dandruff Shampoo certainly has the formulation needed to live up to its promise of doing away with loose dandruff flakes. Now what about the accompanying formula, are there any other helpful anti-dandruff actives? Are there any ingredients to be wary of? While most anti-dandruff shampoos have a basic selection of ingredients ORIBE Serene Scalp Anti-Dandruff Shampoo has a complex and very relevant ingredients list. …and we really could go on. ORIBE Serene Scalp Anti-Dandruff Shampoo has an extensive list of hydrating, conditioning, soothing and antioxidant scalp actives. One like no other we’ve seen and one which “possibly” warrants a larger than normal price tag. Now what about ingredients to be wary of? • Cocamidopropyl betaine – a secondary surfactant which has potential to cause contact dermatitis. It has the dubious distinction to have been awarded the title of Allergen of the Year in 2004 by the American Contact Dermatitis Society. All of the above ingredients have potential to cause allergic reaction, therefore if you know your scalp or skin’s especially sensitive or reactive to fragrance ORIBE Serene Scalp Anti-Dandruff Shampoo’s not the one for you. But overall what a great formulation. 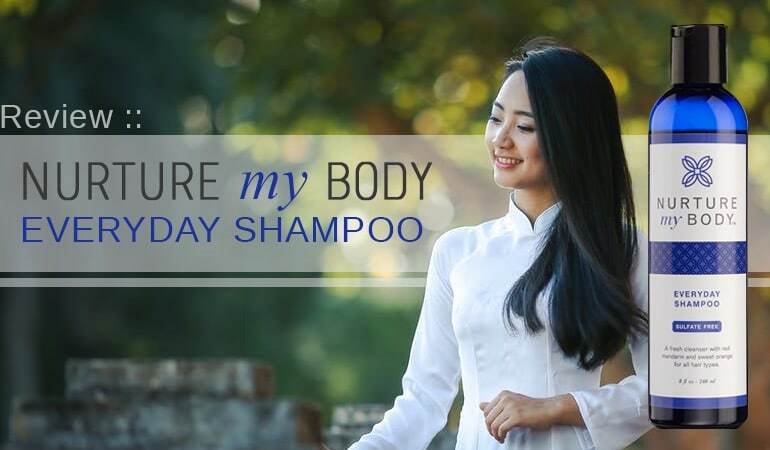 An anti-dandruff shampoo which is packed with ingredients for helping improve the health of your scalp – which is ultimately what will help your skin clear dandruff naturally. A great product. Not for those who are sensitive to fragrances, but definitely one to watch out for. Whether it’s worth the price is a subjective thing. I probably wouldn’t pay it, but I wouldn’t pay $20 for a moisturizer either. It’s still a salicylic acid shampoo, and there are plenty of those, but the additional ingredients are definitely unique. I’ve seen nothing like this before and it’s a welcome addition into the world of dandruff shampoos. Someone tell the makers of Nizoral!